Shredding standards and accreditations: what do they mean? Home / Blog / Shredding standards and accreditations: what do they mean? What are the relevant standards, accreditations and professional memberships for a shredding provider? And what do they all mean? When you choose a supplier to shred your unwanted documents and other items, it’s important to understand that not every shredding provider is the same. With the forthcoming GDPR tightening up the regulations on how you should collect, retain and dispose of data, it’s never been more important to know who you’re dealing with and make sure your data is being disposed of in a secure way. We carry out our shredding to the highest standards of quality and security. All our staff are security checked, and we also offer satellite tracking of vehicles and CCTV in all vehicles and depots. Choose our mobile shredding service and you can literally watch your documents or digital media going on to the vehicle and being destroyed. If you prefer off-site shredding, we’ll collect your material and securely transport it to our high-security premises for same-day shredding, providing a certificate of destruction as confirmation. 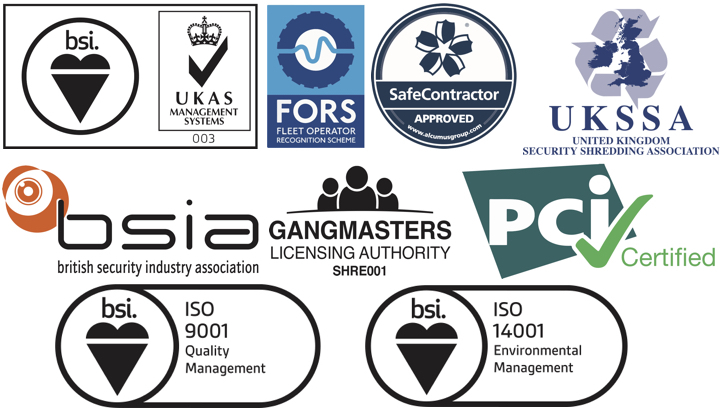 Finally, we are currently the only security shredding provider to be accredited by the Gangmasters Licensing Authority (GLAA), showing that we are a responsible employer with a strong commitment to the welfare, health and safety of our staff.